Compare to February 4, 2015. Awesome job 5am, so glad we could all suffer together this morning! Accidentally switched the push press and knees to elbow around. Thanks Max, Rx would have evened it up. And to no surprise the wallballs took me FOREVER with some no reps in there as well….LOVE them! 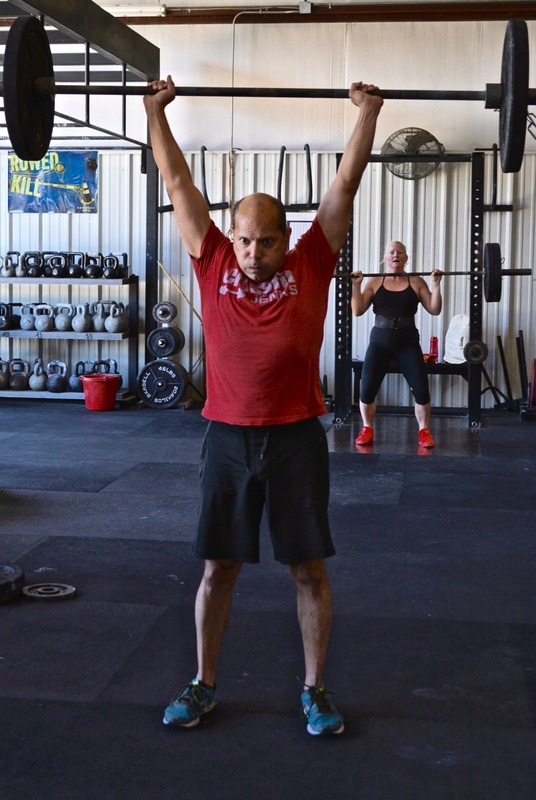 First off Ed and Michelle are a Bad to the Bone CFJ Couple that know how to WOD and have fun yet go hard while doing it. Teammates in training! Oh Yea. Loving all the PRs today. Congrats Shows great consistency, attention to form, technique and efficiency, but best yet I believe we have increased work capacity across broad time and modal domains. Keep it up CFJ. K2E and WB’s were rough! Great job Royce and Max! Burpees took at least 5 minutes. 40 lbs kettle bell and knees to elbow on the rings. That did not feel good. Could not get into the zone today. Did a lot of complaining about the burpees. Boy.